Many tools have come and gone in your kitchen, but none are as powerful or as iconic as the KitchenAid mixer. It boasts a solid steel 'direct drive' transmission that delivers ten speeds of power straight from the 300 watt motor to the beater. It is also highly precise, with a 67 point planetary mixing action designed to thoroughly scrape every inch of the bowl, leaving no food behind. The planetary motion makes making Meringue a pure and utter joy. 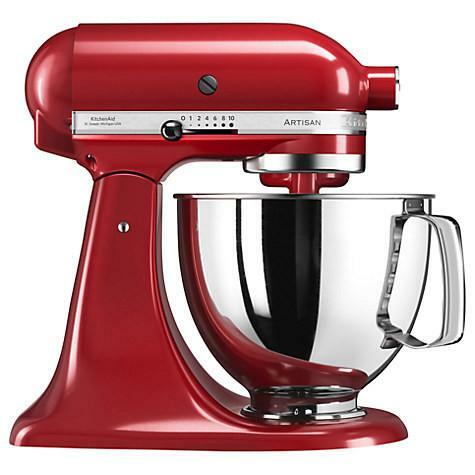 We are sure you know that the KitchenAid Artisan mixer is a multi-functional kitchen appliance. Simply by adding attachments to the power hub, it virtually transforms the corner of your counter top into a self-contained professional kitchen that would put even the most expensive mixer to shame. Items and accessories such as pasta makers, meat grinders, juicers and much more can be attached to the mixer making it a versatile machine giving you exceptional value. In addition when you use the ice cream bowl you can make the most delicious creamy ice-cream in less than 20 minutes. Good enough to rival any boutique ice cream company. The Artisan is built to last a lifetime of delicious recipes and idea and attachments it is far more versatile than any other appliance on the market.